Polymer has never played quite so nicely with nature as it does in Rachel Gourley’s hands. Her new website is a delight. 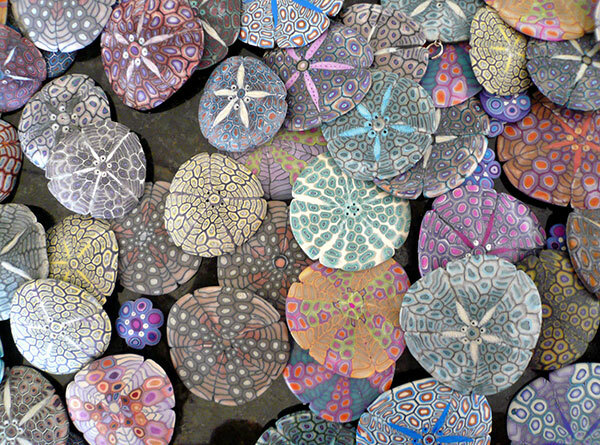 This Vancouver artist takes polymer rocks back to the seashore where they look completely happy. 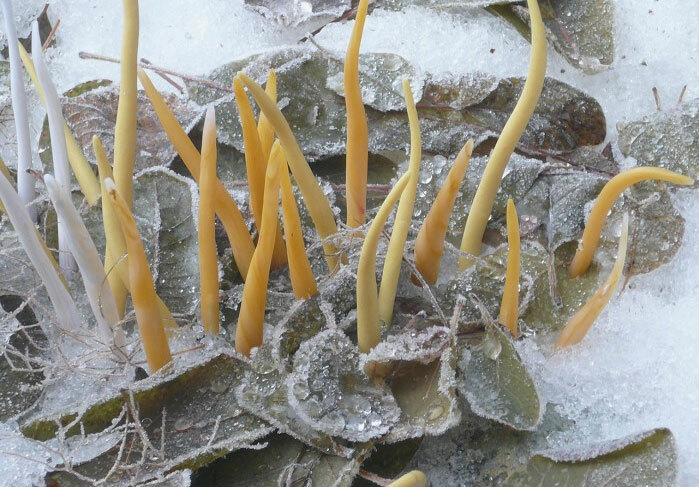 Her clay fungi and early shoots jump out of the surrounding wintry woodland foliage. You might think that her alien artworks are complete abstractions but if you examine her gallery of photos, you can see that her keen eye is drawn to nature’s own bright palettes and outlandish patterns as she’s traveled around the world. PCD has featured her before (check out these polymer sand dollars and 2004 spondylosis) and it’s great that she’s made herself a home on the web where we can visit her more often. Thanks to Lindly Haunani for the link. Very, very inspiring works!I especially liked the outdoor exhibition.How nicely fit works with the nature around! What a wonderful way to start my day. Reading Rachel’s Biography page on her About link on her website put me into a state of bliss. There are a few novels and a couple of self-help manuals and a bundle of inspirational talks, as well as much, much beauty, contained in those few short paragraphs. Rachels’s work is magnificent. It always make me sigh and grin. And as more of us follow Rachel’s lead in taking the online website building class from Susan Lomuto of DailyArtMuse, no doubt we’re all going to start upping our game in beautiful, sophisticated websites. It’s 5:45am here on the west coast and I just rocketed 100% wide awake…no need for a cuppa joe this morning! I fell in love with Rachel’s segmented stalks in a previous post, and was captivated again today with her new work. Rachel’s staging and photography are the icing on an already delicious cake, and made me laugh with delight. What a treat to wake up to her work! Isn’t Rachel’s work wonderful? Helping her build a beautiful website was a joy and privilege, particularly since she was convinced she wouldn’t be able to do it. She did an amazing job and the new website truly supports and showcases her beautiful art. What a true delight. Rachel’s art makes me want to not only celebrate her vision but to also celebrate polymer. It is also making me want to ditch my plans for the day and head to the studio instead and just play. Very inspiring! Wouaouh… It’s wonderful… I particularly love the pictures mixing the real nature with the polymer parts. Thank you very much for the link. I adore everything about this polymer clay artist! Be sure to check out the photography section of her website. Now, where might I purchase a piece of this spectacular work? This is so special, placing your beautiful artwork in nature! it is absolutely powerful! also, the pictures are awesome! Rachel Gourley’s is out of this world. I love the idea that polymer can inhabbit an organic world without loosing its integrity as “polymer”. Her forms…in and of themselves….already breath animation and life quite apart from being placed in the “natural” environment…but this helps people to see I think. The horns look real the color looks like ivory good art.